Egypt’s presidential election on 26-28 March will be as farcical as the elections held during former president Hosni Mubarak’s regime. Just two candidates are standing; the current President, Abdel Fattah al-Sisi, and the leader of the Ghad party, Moussa Mostafa Moussa. Resist Tory war on women! Get. Them. Out. The Tories have got to go. What other response can there be to the Tories’ annihilation of the services needed by women fleeing domestic violence? This equates to murder by political decisions. Brazil: Women show the way - the streets, the struggle and no going back! The 4th March general election has caused the biggest shake-up of the Italian political landscape in over 20 years. Not since the ‘clean hands’ corruption scandal of the early ‘90s have the establishment parties been so severely wounded. In Sweden, #MeToo has found a widespread echo and has been widely organised sector-by-sector. Actors led the way last year with their petition using the hashtag #tystnadtagning - Swedish for "Lights, cameras, action!" which can mean “Stay silent (when someone is assaulted)!”. 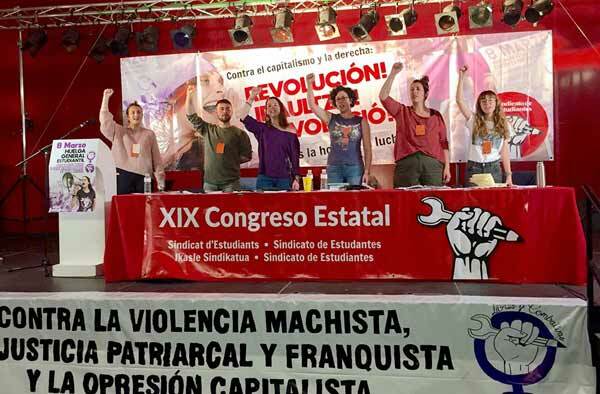 The first state-wide meeting of Libres y Combativas – the socialist feminist platform launched by the Sindicato de Estudiantes and Izquierda Revoucionaria (CWI in Spanish state) was a great success. International Women’s Day 2018 – Spain: Strike against sexist violence on 8 March!